There were lots of important reports on the U.S. economy released this morning. 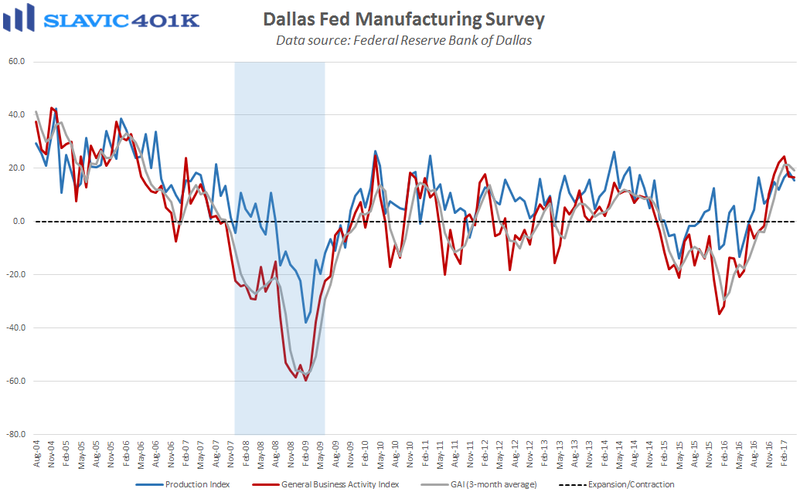 First, data from the Federal Reserve Bank of Dallas showed that business activity in the southern region of the country remained elevated this month. Specifically, the general activity index slid from +16.9 to +16.8 in April, a smaller pullback than expected and still relatively close to the 7-year high hit in February. Under the hood, measures of production, capacity utilization, wages, hours worked, and capital expenditures all deteriorated this month but new orders, shipments, and employment improved. Input cost inflation moderated in April and prices received increased, suggesting less pressure on margins. 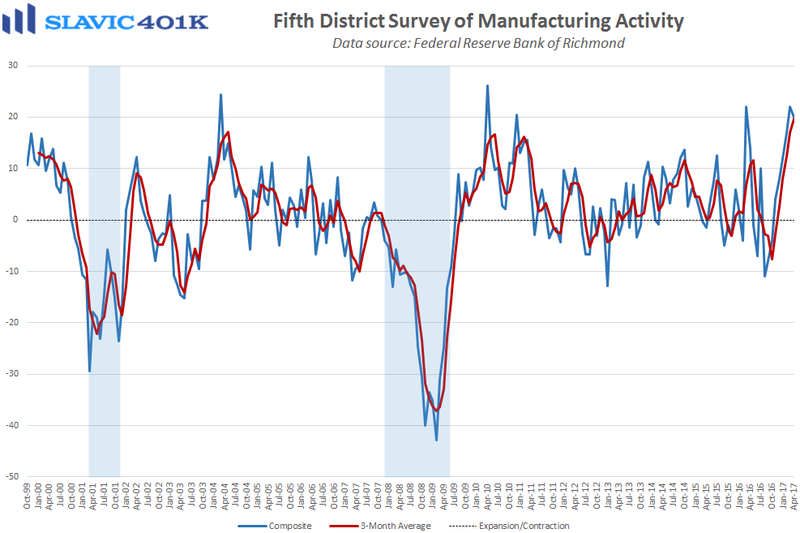 Comments from surveyed manufacturers were generally mixed this month in the 11th Fed District. Worth noting, though, is the one manager who said that “fewer workers are needed as some roles have been replaced by more advanced equipment.” That highlights the expanding role of automation in many industries. 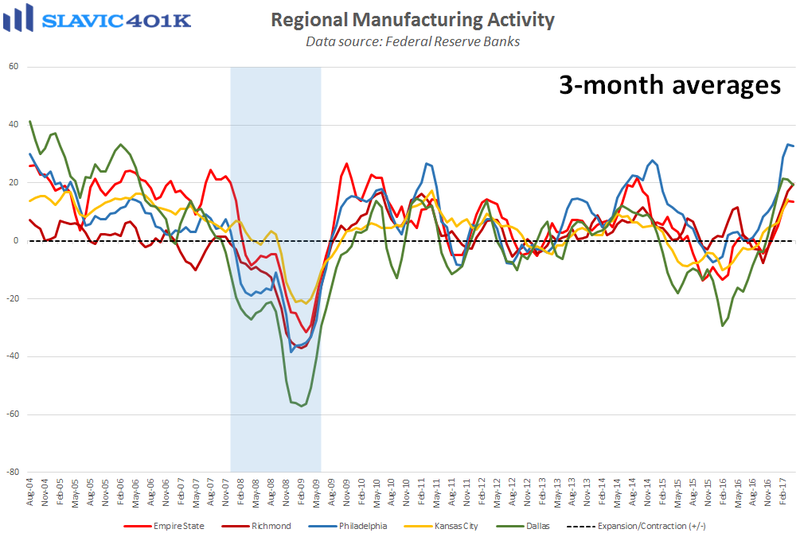 Similarly, a report from the Federal Reserve Bank of Richmond showed that manufacturing activity in the Mid-Atlantic region of the country expanded at a slightly slower pace this month. Specifically, the composite index slid from +22.0 to +20.0 in April, a smaller decline than anticipated and still one of the best readings of the current business cycle. Shipments and capacity utilization improved this month but gauges of order backlogs, total employment, hours worked, and capital expenditures all deteriorated. 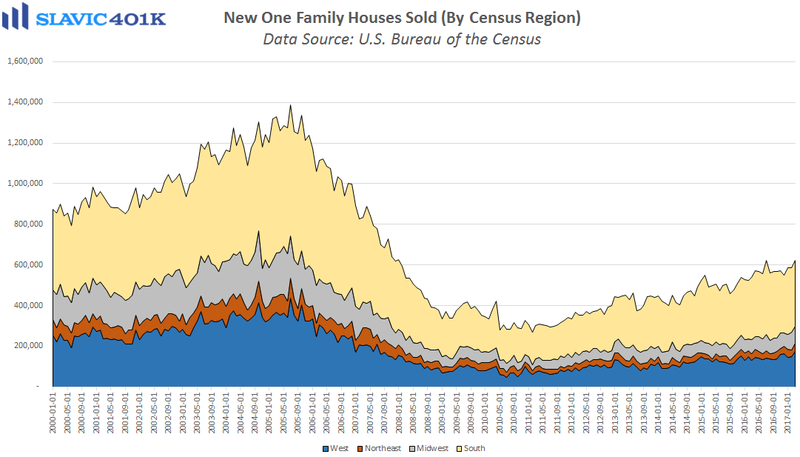 Next, a report from the U.S. Census Bureau showed that sales of new single-family homes in America rose by 5.8 percent in March to a seasonally adjusted annual rate of 621K units. That was much better than economists had expected and the fastest sales pace since July of last year. Regionally, home sales in March fell in the Midwest (-4.5 percent) but rose in the South (+1.6 percent), the West (+16.7%), and the Northeast (+25.8 percent). 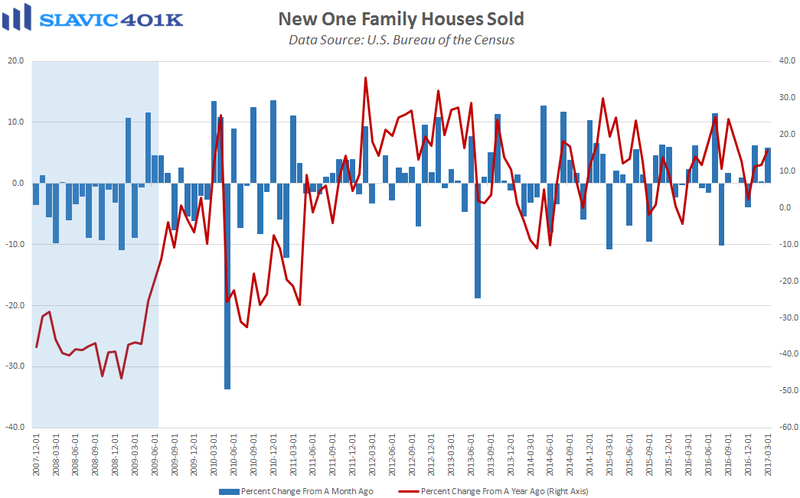 The inventory of new single-family homes lifted for the 8th month in a row in March, and months’ supply slid to 5.2 based on the current sales pace. 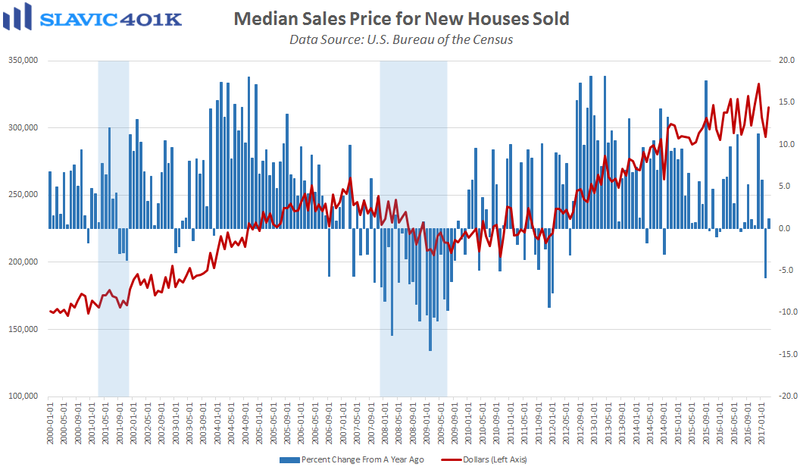 The median selling price of new houses sold lifted to $315,100 in March. 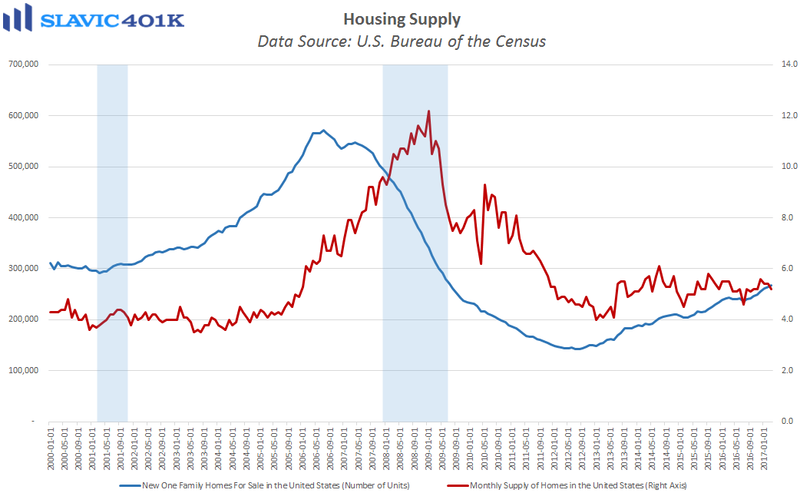 Speaking of rising home prices, the Federal Housing Finance Agency’s (FHFA’s) national home price index (HPI), also released this morning, jumped by 0.8 percent in February (lagged release), significantly more than expected and the 61st monthly increase in a row. That helped lift the year-over-year rate of growth to 6.4 percent, the highest reading since September and well above current measures of wage growth and consumer inflation. 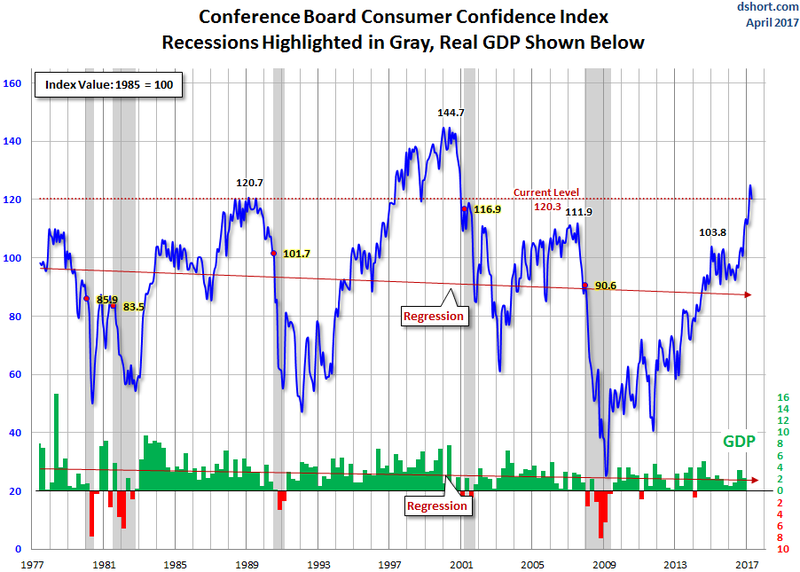 Elsewhere, the consumer confidence index from The Conference Board fell to 120.3 in April, worse than anticipated and the prior month’s reading was revised slightly lower. Under the hood, surveyed Americans’ general appraisal of both present and future economic conditions deteriorated this month. 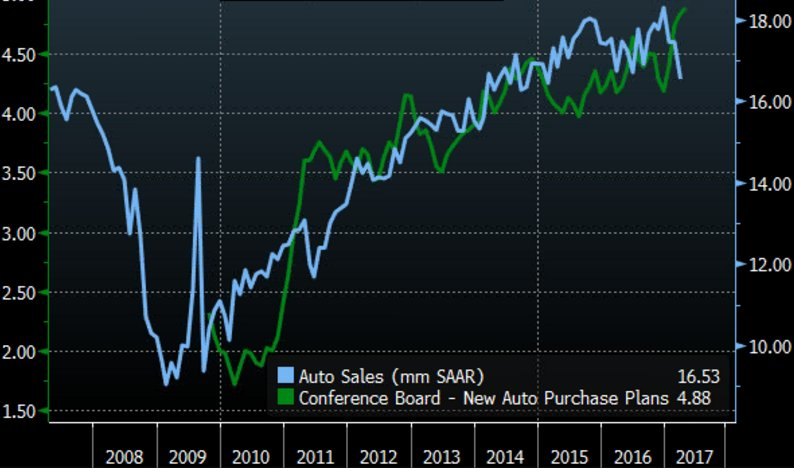 However, the headline sentiment index remains at one of the best levels of the current business cycle and suggests that there could be an uptick in real consumer spending this year, especially in the area of automotive sales. Moreover, 23.0 percent of surveyed Americans said that they expect jobs to be more plentiful in the months ahead, and 19.3 percent anticipate higher wages.